Drop Target reader Ralph Mandarano sent in this photo of our zines framed and up on the wall next to his Creature From the Black Lagoon! We are honored to be in such good company, and on the "wall of fame." 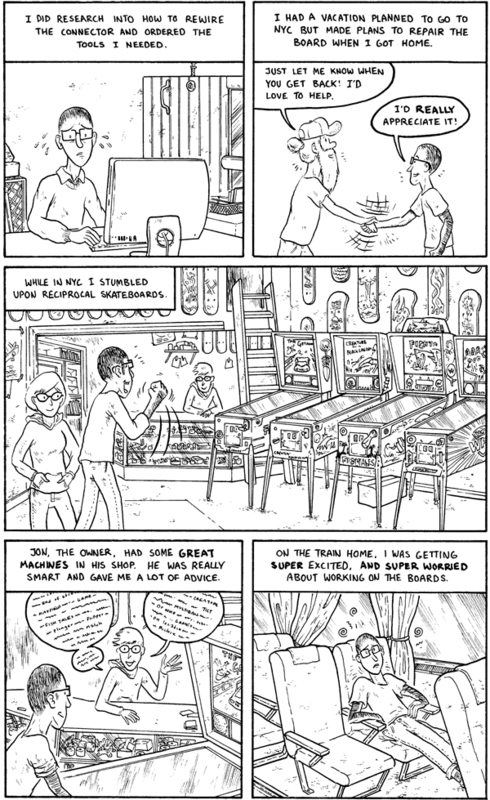 Phew, remember that time that Jon Chad posted that SUPER WEIRD COMIC? Well, we're back down to planet earth now with some more photos from the Stern tour I took last summer. I guess this is a good time to point out that I'm not going to be going into too much detail of what is going on in most of these photos. That will all be explained in the interview. For now, just let your mouth drool at this pinball beauty. As I mentioned before, Stern was making the Limited Edition of the AC/DC machine when I was visiting. 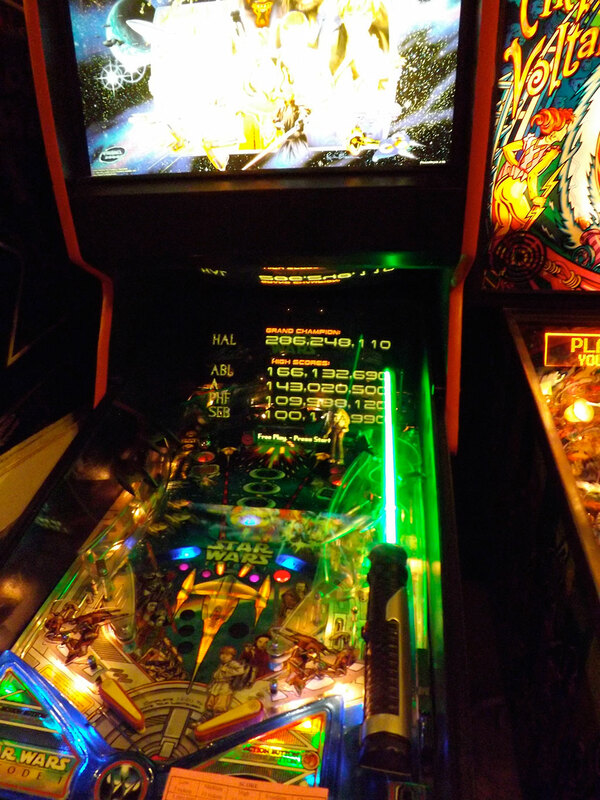 One of the most exciting parts of that game is that the LE had a lower playfield (just like Gottlieb's Haunted House or Black Hole). On the day we were visiting, the factory had just gotten in a shipment of lower playfields to test. !!!!?1/1!!!?!? Color me excited! Plastic parts (slingshot covers, etc). If it looks like there is a haze, or goo on them, that's a protective film that they put on before they put out the plastic so that it doesn't crack. Next time: images of the assemble line and unfilled cabinets! Hi gang, I'm catching up with some blogging this weekend, so I've queued up a few posts. 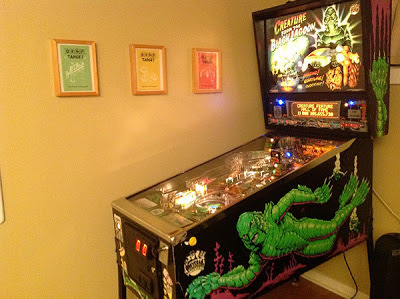 Between these and the posts Jon has saved up, plus our blog at Stern, there should be quite a bit of Pinball action hitting the internet in the next few weeks! First up is Playland Not-At-The-Beach. A few months back, Claire and I went to this great bay-area pinball stop. They actually have all kinds of cool stuff (old carnival games, little model cities and circuses, etc. etc.) 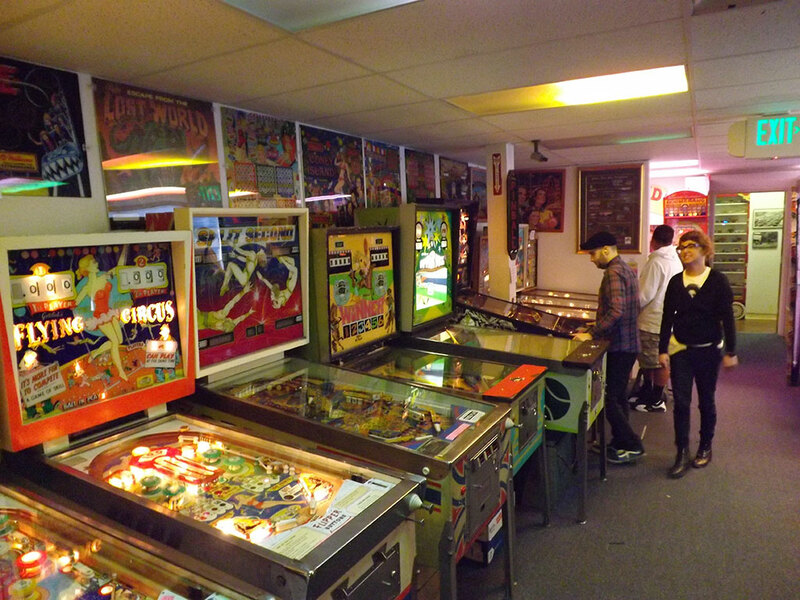 but the highlight was the back area, which is a regular pinball paradise. Plus a room full of DMD machines. All the machines were in great working order. This place is highly recommended! It was also really cool how they had lit-up backglasses above the machines. Floor-to-ceiling pinball! Tucked in the corner was a Star Wars: Episode I pin2k machine, which, if you've read DTZ #1, you know is one of my favorite machines. I put up a 166M for the #1 score. It always feels good to leave your initials in at least one machine before leaving an arcade! Verily, my friends, truer words have never been spoken. You CANNOT talk about SWE1 pinball without talking about Jar Jar. He is covering that game like my aunt's famous cranberry sauce. 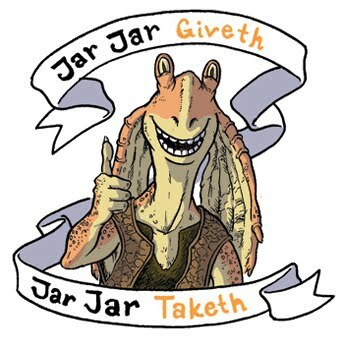 This Jar Jar giveth...etc. line was a joke that Alec and I came up with in frustration at Jar Jar and SWE1 pinball, but it has become our de facto go-to line whenever we catch a bad break in pinball. You know the feeling; you get the ball in a scoop that awards an extra ball, only to have the ball be IMMEDIATELY hurtled straight down between the flippers! Just take a moment to breathe and be thankful that we are living in a world with pinball. And, you know what, I know you're thankful for having seen this today. Pinball Gril Saves the Day! I drew this comic for back last spring, and wanted to post it here. Rereading it now, I'm realizing how weird it is. I don't know what's funnier, though; the joke about getting a replay, or the friend at the end who doesn't get pinball. We've ALL been there, right? Enjoy! Phew, more photos for your guys from my Stern factory tour this summer. They were working hard on the limited edition of ACDC, and I am SUPER-DUPER grateful that Jody took the time to show me around! After the parts are cleared by the first station pictured in the last post, they are stored here. There were translites, bulbs, boxes of McDonalds toys, you name it! WIRES!!!! Even though this mess looks like multicolored spaghetti dinner, it is actually a finely planned and bundled group of wires. Using these template mounted on wood, workers measure out and put connectors on different combinations of wires. The one thing above all else that continually impressed me during the tour was a) how much hands on man hours are put into the making of a pinball machine and b) how finely orchastrated all the different departments and different procedures are. Just walking through the factory, I could barely fathom making ONE pinball machine, let alone THOUSANDS! Hey pinballers! Looking for something fun to watch this weekend? Why don't you swing on over to HULU and check out the November 1st episode of X-Play. Normally, this is a show about video games, upcoming titles, designers, etc. WAIT! "This lad's a traitor," I hear you cry, "A regular 8-bit Benedict! Throw him overboard!" Before your mutiny gets out of hand, listen to this! 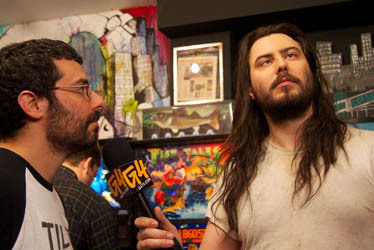 On this particular episode of X-Play, Andrew WK (who is apparently a HUGE pinball nut) goes to Reciprocal Skateboards in NYC to check out some league play, and sling the Silverball around himself! It's a lot of fun to watch. Devotees of DTZ will remember that in my Issue 3 Zeroes to Heroes story, I visited Reciprocal for the first time. Back then, there were only 4 machines in their one storefront. This was back in, what, 2010? 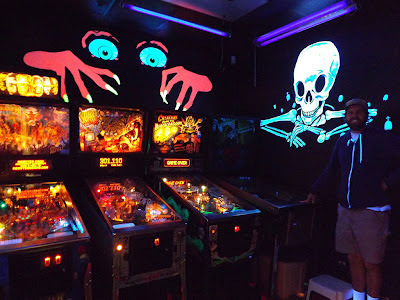 Since then, the owner Jon has bought the storefront NEXT to Reciprocal and turned it into a pinball arcade! There are 10 machines in there (last time I went), and they are all in tip top order. Jon is REALLY great guy, and it's great to see his shop get this kind of attention. 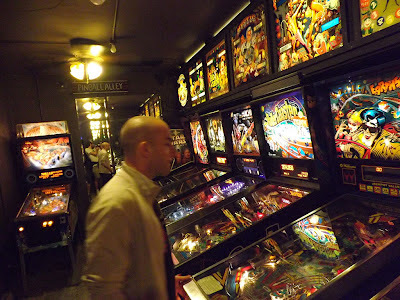 If you are in NYC and like pinball, you HAVE to go to Reciprocal! Again, HERE is the link to the X-Play Episode! Check it out before they take it down!! Hey Guys, Man alive, I KNOW that Alec has been a straight up champ taking over the brunt of the posting, but don't think that there hasn't been any pinball in old Jon Chad's life! Things got a little out-of-control busy this summer, so now I'm going to drip drip drip some of the pinball goodness that has been happening with me! First, I've got some photos from the Stern factory tour that I was given over the summer. This was, single-handedly, the most exciting thing that had happened to me involving pinball. Not only did I get to see the inner workings of how these blessed machines are made, but I got to talk to my favorite designers, George Gomez and Steve Richie, and I got to talk to the head honcho himself, Gary Stern! I got an amazing interview that I'll be using in an issue of Drop Target TWO issues from now! I KNOW I KNOW! Don't worry though, it's WORTH it! Oh lordy! THIS IS REALLY HAPPENING!!! Jody from Stern was nice enough to show us around! The station where they check the incoming parts against the bluprints to make sure they're up to snuff. A collection of some of the various toys that Stern has made for their games. Some of them they sculpt in house and get molded in another facility, sometimes they use preexisting figures, like the family guy or Batman figures. Sometimes, like with the Shrek game, they found that the toys made by McDonalds would suffice for the pin. All they did was call up McDonalds and say, "could you give us...I don't know FOUR THOUSAND of your Shrek toys?" " Pull around to the second window." the voice on the other end said weakly. That's how it went down, right? Chart of rubber rings, inserts, flashbulb covers etc. And this is only the beginning! Wires and parts next time!